Home / Campaigns / What are Campaign goals, and how should I use them? 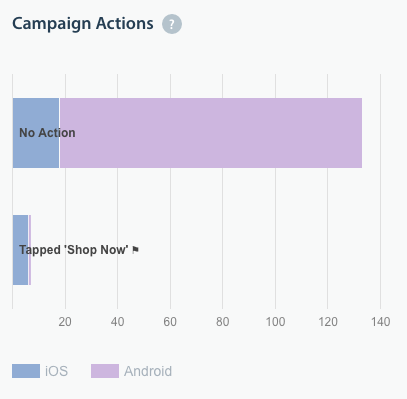 Campaign goals allow you to track the performance of in-app message Campaigns by counting the amount of times end users completed an action offered by the Campaign. When creating or editing a draft of an in-app Campaign, you have the option to select the ‘Count this action as campaign goal completion’ check box. This will ensure that the Campaign results will count towards this goal. Once the Campaign is running, on the Campaign analytics page, you’ll see a flag icon next to the action type in the ‘Campaign Actions’ section of the Campaign analytics page. This indicates that your goal is to have users complete one of these actions. Please note: If none of the actions associated with the Campaign are marked for goal completion, then the conversion rate for that Campaign will be 0%. To start setting up Campaigns with goals, see What are Campaigns and how do I use them?